‘Imagine coming down with a flu, then having to run a marathon through treacle, then being forced to take an exam for three hours and then after all this, staying up the whole night without rest. That is how the 17 million people worldwide diagnosed with Chronic Fatigue Syndrome (CFS) or ME feel every single day. M.E. (ME) stands for Myalgic Encephalomyelitis (meaning inflammation of the brain). Those with the condition sometimes prefer this term, although the more recent term is Chronic Fatigue Syndrome (CFS) – a term used to describe unexplained fatigue which lasts longer than 6 months. CFS as a syndrome implies that there are multifaceted causative factors (which may remain unknown) and that cases are individual. Gentle yoga, pranayama and meditative practices can aid in recovering from symptoms of CFS/ME by calming down the whole of the central nervous system. Charlotte Watts, award-winning nutritionist and yoga therapist specialising in stress, fatigue and burnout related conditions and author of The De-Stress Diet (2012) and its forthcoming follow-up The De-Stress Effect, and Leah Barnett, expert in teaching Yoga for ME/CFS to private clients and those on retreats, have provided a few guidelines for yoga teachers when incorporating practices to their clients suffering with CFS/ME. It is important to remember that those with ME and chronic stress, are often maintaining some kind of fight-or-flight pattern. This means that we need to help our students to ‘ground’ and to feel more present. We also need to use lots of touch (with permission) such as mudra or nyasa (hand placement) – as this helps to switch the parasympathetics on and to switch off the stress response. But one of the most important things in a yoga practice specifically for stress, fatigue and ME is to help the student to come back into their body. As far as their head is concerned, they are usually several miles away, so they need help to feel that they are fully inhabiting their physical being. This can be done in several ways – such as by encouraging the student to focus on the inner-energy field of the body, or by directing their awareness around the body or by asking the student to feel where they are in relation to the mat. The teacher should frequently remind the student during the session to explore the body with their awareness – and to come back to their breath. The breath, of course, is the major tool for helping students to be here now – to be aware of their own presence. Throughout the practice invite them to breathe slowly and quietly through the nose, from the diaphragm and encourage them to focus on the exhale. It is a very good idea to remind them to come back to the breath throughout the practice. When managing clients with CFS/ME, it is crucial to incorporate practices that use the principles of releasing and detoxing (working with the energy of apana) and relaxing granthis (knots) in the prana maya (kosha) to bring about sattva. So, for stress, fatigue and CFS, we are using very gentle langhana practices to create space for prana to flow and for healing to come about. In a langhana (cooling, grounding, calming practice) yoga session, we work with lots of calming forward bends and we always focus on the exhalation. Forward bends soothe the front brain as they invite surrender when we are allowing them to unfold and not pushing in. 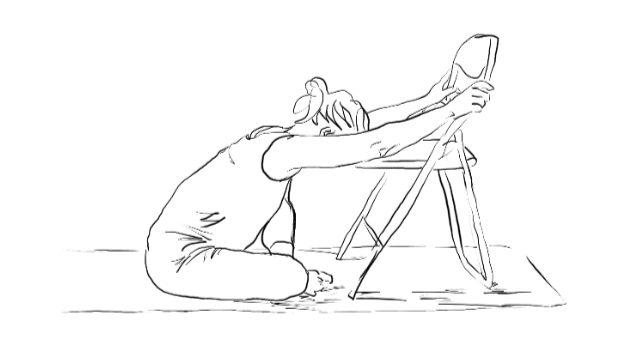 This (above) version to a chair can be done with crossed legs or straight out in a gentle wide stride; any position where your lower back is comfortable and you feel you can easily bend forward. Sit on a cushion or block if you feel you drop backwards and need to round the back to come forwards. Bring your forehead onto the seat of the chair (put something soft there if you need), allowing the weight of your head to create pressure their and even roll a little across this area for more soothing effects. This activates the trigeminal nerve that engages the vagus and parasympathetic, calming action. Fold your arms onto the seat above your head to stay a while when you’re fully comfortable. Forward bends are associated with mind calming and surrender. 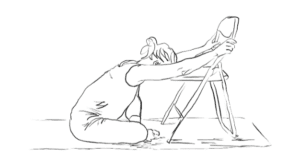 In these poses, the lower back is in ‘passive tension’, where each inhalation contracts it, whilst each exhalation releases it, allowing more depth into the pose. This adds to the attitude of allowing over forcing that is part of yoga philosophy. Pushing into forward bends creates a contraction that actually forms a barrier to stretching, the lung emptying of the exhale draws the diaphragm into the chest and creates a cave into the abdomen that gives us space to drop in further. Focussing into full and spacious out-breaths relaxes the back and tilts the pelvis forward. As stresses of the day can create breathing that is dominated by the in-breath, mindful attention exhaling into forward bends sets the scene for sleep. Both the focus on the exhale and the opening of the back body (stimulating the liver and kidneys) activate the parasympathetic nervous system. When we also support the head during forward bends, we create the ability to let go of the weight of the head and soften the eyes, jaw and mind; key focuses in a sequence for sleep. Forehead pressure on a prop also provides a gentle forehead massage that stimulates the pituitary gland, which controls melatonin, as well as the trigeminal nerve. More important than the perfect posture is how we feel in body, breath and mind. There should be a harmony in our practice. Patanjali talks about the concept of sthira and sukha. Sthira is about steadiness and alertness within a posture while sukha is the comfort of the posture. Both these qualities should be present to the same degree. The inhalation tends to be associated with stirham and the exhalation with sukham. But both sthira and sukha are essential – one is never sacrificed for the other. 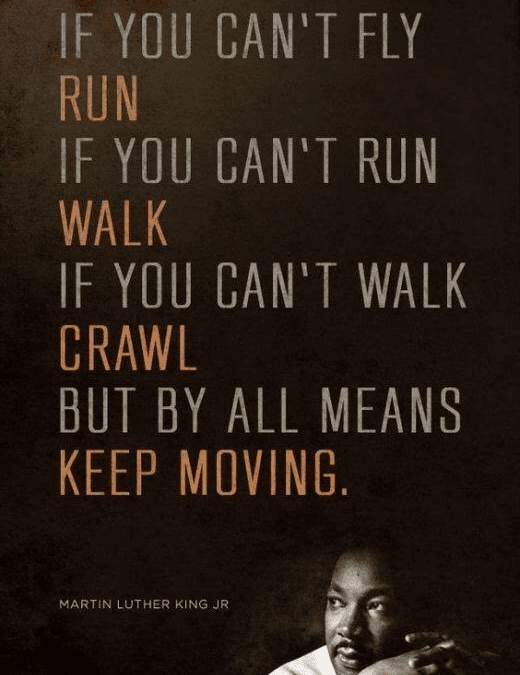 What this means in practical terms, is that there should never be any tension or restriction within any movement. If we push or try to get into a fixed or rigid posture, we may actually reinforce unhelpful samskaras which further stress the body. So yoga should be about light, but conscious endeavour – our practice is focused but never forced. Remember that asana is about freeing the whole system so the practice should be energising and not tiring. People with ME tend to be very flexible but they have poor muscle tone and little strength – so we have to be very careful not to push them to hyper-extend in a posture. Breath awareness and breathing practices should always be approached very gently as they are potentially very powerful. People experiencing stress burn out/ME/CFS often have entrenched breathing patterns which exacerbate their experience (shallow, fast, inhale dominant). Bringing awareness to and beginning to change these patterns can, if not done slowly and gently, cause stress and anxiety as well as physiological changes which can bring about unwelcome sensations. Recalling Dhirga Sukshma (YS 250) which encourages us to cultivate a smooth, even breath which brings about ‘great peace’ (suksma) it is the resulting experience which is important not having a prescribed length of breath. We can think of the breath as an offering – Isvara Pranidhana (YS 1:23). Desikachar, one of the great yoga masters of the 20th century said that the breath takes us closer to purusha – (ie to the present moment, to ‘I Am That’). So the purpose of pranayama is to quieten the mind so that we may inhabit the present fully.